PEARL RIVER, NY Jan. 10, 2017 — Calling all teachers who strive for that, “Oh, Wow!” moment in their classrooms. O&R this week announced that it will award grants totaling $35,000 to support classroom projects and teacher professional-development initiatives. Those proposals should ride the cutting edge, focusing on science, technology, engineering and mathematics (STEM). Past successful proposal topics have ranged from drone crop monitoring to robotic competitions to hydroponics and 3-D printed solar vehicle construction. O&R will make 35 STEM Classroom Grants of up to $1,000 each to educators at schools (pre-kindergarten through grade 12) and youth group leaders for the 2017-2018 school year in communities located within O&R’s service area. That encompasses: Rockland and parts of Orange and Sullivan counties in New York and parts of Bergen, Passaic and Sussex counties in New Jersey. Any creative classroom project designed to improve, advance and enrich student learning in science, technology, engineering and mathematics will be considered. Grants will be awarded based on a review by the O&R STEM Education Advisory Council, a panel of educators and engineers assembled by O&R expressly for this process. Resources requested should be integral components of a well-planned classroom project/lesson plan and important to its success. O&R seeks educational proposals that range from formative ideas that explore learning concepts to fully tested models that are ready to be adopted and disseminated. Ideally, the successful proposal would focus on the study of electricity and electricity production, natural gas exploration, renewables, and clean energy. 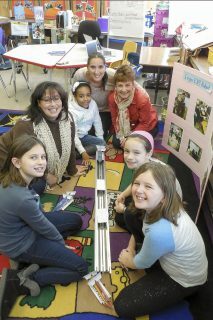 The STEM Classroom Grants Program application can be completed online at www.oru.com/STEM. The application must be received by O&R no later than 5 p.m. on March 31, 2017. The grants will be awarded in May.